Arterial injuries following total hip arthroplasty (THA) are uncommon and are usually related to revision THA. Deep external pudendal artery injury and delayed bleeding due to percutaneous adductor tenotomy during THA has not been reported. A 62-year-old man with bilateral hip osteoarthritis and ankylosing spondylitis was treated with right cementless THA. Persistent severely limited hip abduction after prosthetic implantation required a percutaneous adductor tenotomy, which was performed bilaterally. No clinical signs of bleeding existed postoperatively. On postoperative day 3, the patient had a hypotensive attack, his right anteromedial thigh at the tenotomy site was distended, and the hemoglobin was 5.9 g/dL. Computed tomography angiography of the iliac and femoral vessels showed a right hematoma medial to the common femoral artery, with active contrast extravasation. Volumetric data reconstruction revealed active bleeding from the right external pudendal artery into an inguinal collection. Angiography was performed by the standard Seldinger technique via the contralateral femoral artery. A guiding catheter was placed as near to the lesion as possible. A microcatheter system and microguidewire were used for superselective catheterization, and 2 embolization coils were used to control the bleeding. The patient remained hemodynamically stable and was discharged 12 days later. Two-year follow-up was uneventful. The deep external pudendal artery may be injured during percutaneous adductor tenotomy, especially in patients with fragile arterial walls, and life-threatening complications may occur. Angiography and embolization are the best treatment options. Drs Sandri, Regis, Marino, Bonetti, and Toso are from the Department of Orthopaedic Surgery and Traumatology, and Dr Perandini is from the Department of Radiology, Azienda Ospedaliera Universitaria Integrata, Policlinico GB Rossi, Verona, Italy. Drs Sandri, Regis, Marino, Perandini, Bonetti, and Toso have no relevant financial relationships to disclose. Correspondence should be addressed to: Andrea Sandri, MD, Department of Orthopaedic Surgery and Traumatology, Azienda Ospedaliera Universitaria Integrata, Policlinico GB Rossi, Piazzale LA Scuro 10, 37134 Verona, Italy (andrea.sandri@ospedaleuniverona.it). Arterial injuries following THA are rare and usually related to revision THA.4–6 To our knowledge, delayed bleeding due to percutaneous adductor tenotomy during THA has not been reported. This article describes a case of deep external pudendal artery injury following percutaneous adductor tenotomy during THA for hip osteoarthritis in ankylosing spondylitis. Vascular damage caused delayed bleeding and severe anemization, which required urgent coil embolization. The patient gave informed consent for data concerning his case to be reported. 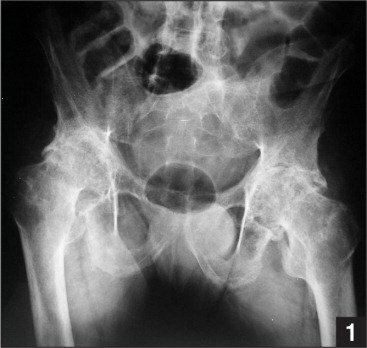 A 62-year-old man with bilateral hip osteoarthritis (Figure 1) and ankylosing spondylitis was admitted for a right THA. He had a medical history of hypertension treated pharmacologically and no bleeding disorders. Preoperative blood values were normal (hematocrit, 39%; hemoglobin, 13.4g/dL). Preoperative hip range of motion (ROM) was limited bilaterally (right flexion and extension between 100° and 70°, abduction 5°, adduction 0°, external rotation 10°, internal rotation 5°; left flexion and extension between 100° and 40°, abduction 5°, adduction 10°, external rotation 15°, internal rotation 10°). Figure 1: Preoperative anteroposterior radiograph showing bilateral hip ankylosis. Under general anesthesia, cementless THA was performed via an anterolateral Watson-Jones approach (Figure 2). The persistence of a severely limited hip abduction after prosthetic implantation suggested performing a percutaneous adductor tenotomy, which was performed bilaterally by the senior author (D.R.) using a size 11 scalpel. 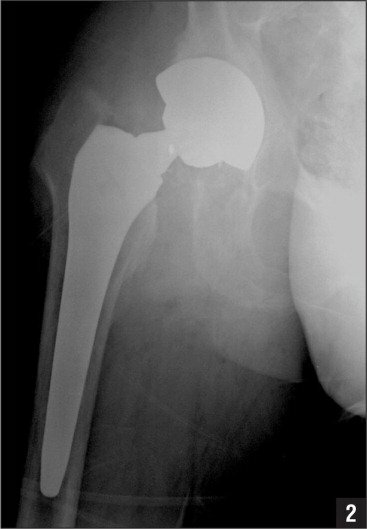 Figure 2: Postoperative anteroposterior radiograph showing right cementless total hip arthroplasty. Postoperatively, no clinical signs of bleeding existed. However, acute anemization (hemoglobin, 7.8 g/dL; hematocrit, 23.3%) and hypotension (blood pressure, 90–50 mm Hg; pulse rate, 95 beats per minute) developed 8 hours postoperatively. After transfusion with 2 units of concentrated red blood cells, the patient was hemodynamically stable. He started a standard rehabilitation program, including passive hip joint ROM 24 hours postoperatively. On postoperative days 1 and 2, blood values were stable (hematocrit, 33.3%; hemoglobin, 11 g/dL; and hematocrit, 31.1%; hemoglobin, 10 g/dL). On postoperative day 3, the patient had a hypotensive attack. Blood pressure was 70 to 40 mm Hg, with a pulse rate of 120 beats per minute, and clinically his anteromedial thigh at the site of tenotomy was distended. Hemoglobin was 5.9 g/dL. After resuscitation with 4 units of packed red blood cells, intravenous fluids (1000 mL of crystalloid and 1000 mL of colloid fluids), and 2 units of fresh frozen plasma, he was stable (blood pressure, 130–52 mm Hg; pulse rate, 70 beats per minute; hemoglobin, 9.1 g/dL). Computed tomography (CT) angiography of the iliac and femoral vessels was performed with a Somatom Sensation 64 CT scanner (Siemens Medical Solutions, Forchheim, Germany), showing a right hematoma with a major axis of 48 mm medial to the common femoral artery, with active contrast extravasation. Accurate volumetric data reconstruction revealed active bleeding from the right external pudendal artery into an inguinal collection (Figure 3). Echo Doppler confirmed an anteromedial circulating hematoma, but echo-guided compression provided no substantial benefit. 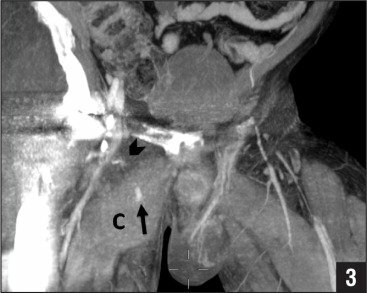 Figure 3: Maximum intensity projection (10-mm-thick slice) reconstruction of a computed tomography scan revealing active bleeding (arrow) from the external pudendal artery (arrowhead) into an inguinal collection (C). Angiography was performed under local anesthesia by the standard Seldinger technique via the contralateral femoral artery. When the bleeding focus was detected, a guiding catheter was placed as near to the lesion as possible (Figure 4). A microcatheter system and microguidewire were used for superselective catheterization, and 2 embolization coils were used to control the bleeding. Repeat arteriography confirmed the efficacy of the procedure (Figure 5). The patient remained hemodynamically stable and was discharged 12 days later. Two-year follow-up was uneventful. 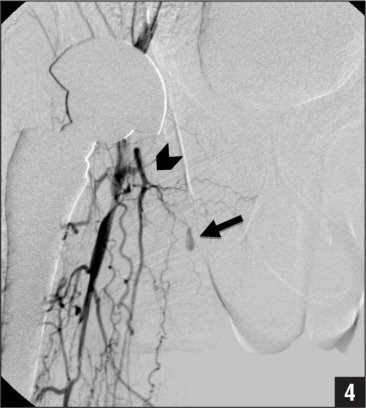 Figure 4: Femoral artery angiogram revealing active bleeding (arrow) from the external pudendal artery (arrowhead). 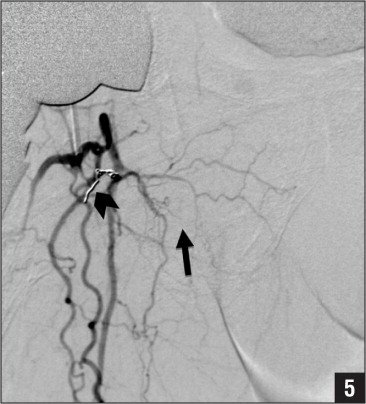 Figure 5: Postembolization angiogram demonstrating complete occlusion of the bleeding vessel (arrow) after coil embolization (arrowhead). Calandruccio12 first reported the risk of bleeding from the branches of the external pudendal artery and vein during a medial approach for hip adductor tenotomy. The external pudendal artery originates from the medial side of the femoral artery as a common branch before dividing into the superficial and deep external pudendal arteries. The deep external pudendal artery runs medially across the pectineus and the adductor longus muscles; as it approaches the medial side of the thigh, it pierces the fascia lata and is distributed to the integument of the scrotum and perineum in men and to the labius majus in women.13 The close anatomic relationship of the adductor longus muscle to this artery may place it at risk of injury during adductor tenotomy. To our knowledge, severe bleeding due to injury of the deep external pudendal artery that complicated percutaneous adductor tenotomy during THA and required an urgent operation has not been reported. Chronic inflammation in ankylosing spondylitis is commonly associated with vascular endothelial dysfunction.14 Gonzalez-Juanatey et al15 reported that patients with ankylosing spondylitis have a high prevalence of subclinical macrovascular disease in the form of increased carotid intima-media thickness and carotid plaques compared with matched controls. Peters et al16 also reported subclinical atherosclerosis and arterial stiffness associated with ankylosing spondylitis. In our case, no intraoperative arterial bleeding occurred, although the patient had a significant hypotensive attack with anemization on postoperative day 3. Passive hip abduction ROM during physiotherapy may be advocated as a causative factor to promote bleeding. A deep external pudendal artery tear occurred during tenotomy, but vasospam probably prevented immediate bleeding. Moreover, a reduction in elasticity and resistance of the arterial wall was likely to have facilitated the vascular complication due to a greater vulnerability to trauma because angiography revealed diffuse femoral artery arteriosclerosis. Massive uncontrolled arterial bleeding complicating THA requires urgent operative repair or embolization.5,7,11 However, embolization seems to have significant advantages over open procedures, such as avoidance of general anesthesia, minor trauma, better location, and control of bleeding maintaining satisfactory hematocrit levels.10,11,17,18 In our patient, echo-guided compression was attempted to stop the hemorrhage but provided no benefit; the hematoma remained circulating. Superselective embolization of the external pudendal artery with the use of 2 endovascular coils was successful. Unlike the standard selective procedure, the superselective technique allows preservation of the blood supply from the uninjured arterial branches. Sweeney S, Gupta R, Taylor G, Calin A. Total hip arthroplasty in ankylosing spondylitis: outcome in 340 patients. J Rheumatol. 2001; 28(8):1862–1866. Lewallen DG. Neurovascular injury associated with hip arthroplasty. J Bone Joint Surg Am. 1997; 79:1870–1880. Nachbur B, Meyer RP, Verkkala K, Zürcher R. The mechanisms of severe arterial injury in surgery of the hip joint. Clin Orthop Relat Res. 1979; (141):122–133. Calandruccio R. Lower extremity. In: Laurin CA, Riley LH Jr, Roy-Camille R, eds. Atlas of Orthopaedic Surgery. Vol 3. Paris, France: Masson; 1991:3. Gray H. Anatomy of the Human Body. Philadelphia, PA: Lea & Febiger; 1918. Shoenfeld NA, Stuchin SA, Pearl R, Haveson S. The management of vascular injuries associated with total hip arthroplasty. J Vasc Surg. 1990; 11(4):549–555. Stock JR, Athanasoulis CA, Harris WH, Waltman AC, Novelline RA, Greenfield AJ. Transcatheter embolization for the control of wound hemorrhage following hip surgery. J Bone Joint Surg Am. 1980; 62(6):1000–1003.